I forgot to mention a circumstance of importance, which occurred on last Friday. As we approached Bolton Station, we passed a cotton gin, which major Keeler intimated to his company, ought to be fired, one of his men accordingly stepped out of the ranks and fired it, General Sherman came up to it just in time to catch the man firing it he was going to shoot him, but the man demanded to be permitted to explain, he stated he had acted under orders from Lt. Blank. The general had the man marched up to the regiment which was called into line. 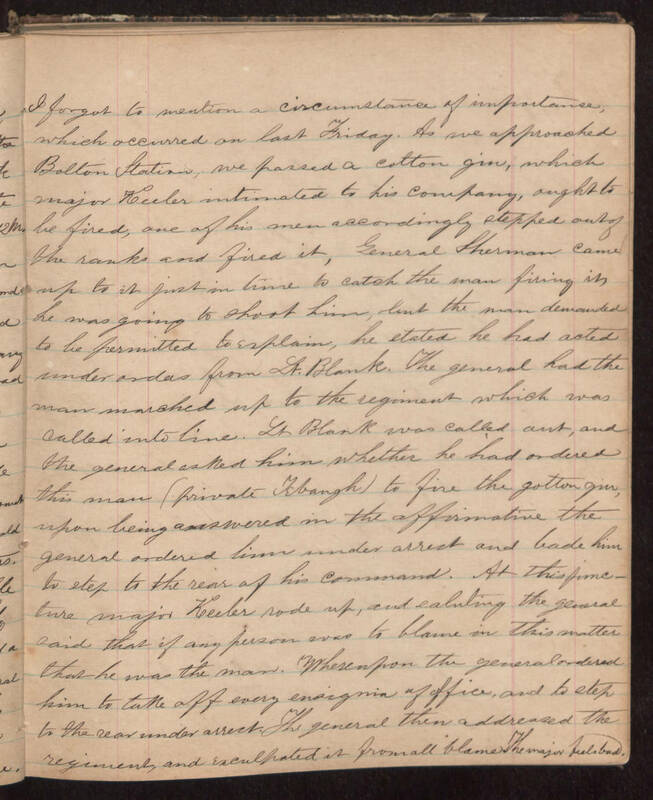 Lt. Blank was called out, and the general asked him whether he had ordered this man (Private Tebaugh to fire the gotten gin, upon being answered in the affirmative the general ordered him under arrest and bade him to step to the rear of his command. At this juncture major Keeler rode up, and saluting the general said that if any person was to blame in this matter that he was the man. Whereupon the general ordered him to take off every ensignia of office, and to step to the rear under arrest. The general then addressed the regiment and exculpated it from all blame. The major feels bad.